This entry was posted on June 13, 2012 at 11:29 pm and is filed under Drama with tags 1983. You can follow any responses to this entry through the RSS 2.0 feed. You can leave a response, or trackback from your own site. Oh man, I haven’t seen this movie in ages. 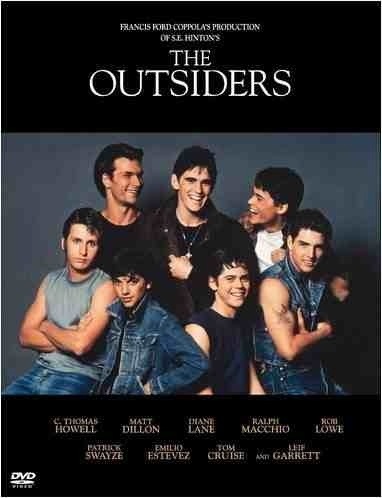 I used to have a crush on practically every guy in this cast, well except Ralph Macchio, ahah. It’s really one of the best movies about teenage angst. This reminds me to finish my Outsider-related post that’s been sitting in my draft folder forever. Thanks Mark! You never had a crush on The Karate Kid? Macchio’s are people too ye know? 😉 Yeah, this was a real gem for me when I was younger Ruth. It’s still decent but a tad childish. I haven’t seen this one in a long time. In school we read the book and then watched this. I’d really like to give the book and the film another shot, I think I’d appreciate it a bit more. I was the same Andy. I remember reading the book in school and then being introduced to the film. If I didn’t have such a fondness for it, I might have rated it slightly less but this is probably the first film that I ever reviewed and dissected in a critical way. It was the only one I ever got in school but I really hope school’s now, still stick by that. Film is the new art form and youngsters should be taught how to be critical in their views (as well as reading books of course). Completely agree with you, Mark. I was lucky enough to take a few film classes as well as a critical writing class in high school but I’m not sure if the average curriculum is moving away from such things. I’ve had no education in film studies or writing whatsoever (it probably shows) but I have an interest and a passion. That’s what keeps me going and i’d bet my bottom dollar that loads of young ones are the same. They just need direction and if they receive these delights at school then there is no end to where they’ll go. It seems as if you have similar school standards in the U.S. but here in Scotland I feel it very important to encourage that side in kids. It doesn’t happen very often – despite a reasonably good selection of successful scots actors around just now. I must admit though, I’m surprised at that. Very good review, Mark! You’re right about FFC picking a great cast! It’s amateurish Coppola but interesting nonetheless. It seems to be a favourite amongst a lot of people in school. It was part of the curriculum when I was young and probably the first film I ever dissected critically. Who would have known that years later, I would be doing that very thing on my own spare time?